England interim head coach Tracey Neville has announced the long squad for this summer's World Cup in Sydney. All 12 players who competed at last year's Commonwealth Games, under former coach Anna Mayes, are retained. 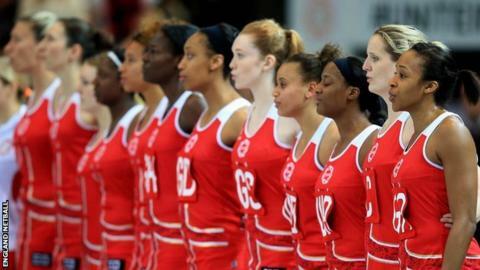 Experienced trio Pamela Cookey, Tamsin Greenway and Sonia Mkoloma are included in the 20-strong list. Natalie Haythornthwaite also makes the cut after making her international debut in the 3-0 tri-series win against Trinidad and Tobago earlier this month. Samantha Cook and Laura Malcolm have made themselves unavailable for selection. Neville, who replaced Mayes on an interim basis in March, led England to the Netball Europe title on Sunday. She will name her final squad of 12 in June before the World Cup in August. Defence: Ama Agbeze, Eboni Beckford-Chambers, Stacey Francis, Layla Guscoth, Geva Mentor, Sonia Mkoloma, Lindsay Keable. Mid-court: Sara Bayman, Sally Butters, Jade Clarke, Sasha Corbin, Tamsin Greenway, Serena Guthrie, Sophia Candappa. Attack: Pamela Cookey, Kadeen Corbin, Rachel Dunn, Joanne Harten, Natalie Haythornthwaite, Helen Housby.